Greetings again from the darkness. When a film opens with a statement that ‘the views expressed are those of the authors and director, and not of the government of Lebanon’, one quickly understands the difference in artistic freedom in that country versus what occurs in the United States, where cartoons and memes regularly poke fun at this country’s President. Director Ziad Doueri and his co-writer Joelle Touma present an intense story of human nature that might happen anywhere, but since the leads are a Lebanese Christian and a Palestine refugee, that opening statement is warranted. One morning, a seemingly innocuous exchange between Tony (Adel Karam) and Yasser (Kamel El-Basha) takes place. While watering flowers on his balcony, the overflow sprays Yasser on the street below. 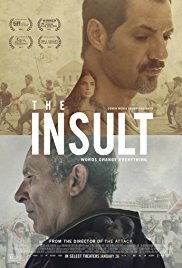 Yasser, a city contractor, orders his team to fix the drainage issue, and Tony reacts violently – leading to Yasser delivering the titular insult. From there, all heck breaks loose. Apologies are requested and never delivered. Appeals to rational reconsideration are made. Tony’s pregnant wife (an excellent Rita Hayek) pleads with him to let it go. Yasser’s boss threatens him with termination. Still, two stubborn and prideful men refuse to give in. The subsequent courtroom drama feature other side stories, not the least of which is the relationship between the two opposing attorneys (Diamond Bou Abboud and Camile Salaheh), one a rising legal star and the other a veteran attempting to make up for a past failure. Emotions run high as two too-proud men turn what was little more than a playground standoff into a national incident being fought in the legal system and the media. Tony is a hot-head who somehow thinks an apology from Yasser is actually an apology for how Palestinians “messed up this country”. Yasser’s stoic nature barely shrouds his bitterness at the world since the Lebanon Civil War. History and childhood roots play a role, but mostly it’s human nature that is at the core of this escalation. Though the title is not plural, there are multiple insults slung throughout the film, each reminding us of the power of words and the futility of the “sticks and stones” phrase. Our own prejudices and preconceptions alter our views and reactions, often preventing us from standing in the other fellow’s shoes. Again, this situation could have played out in most any neighborhood on the globe, but this particular locale shows various ethnic and religious groups are still grappling with what it means to live together – despite the years of wars and unrest. We don’t see a great deal of Middle Eastern cinema, but three days after I watched this film, it became the first ever movie from Lebanon to receive an Oscar nomination (Best Foreign Language Film) … proving yet again that the language of cinema is universal. This entry was posted on Thursday, February 1st, 2018 at 8:56 pm and is filed under Drama, World Cinema/Foreign. You can follow any responses to this entry through the RSS 2.0 feed. You can leave a response, or trackback from your own site.